Learn various strategies on how to reach the right people through calculated account selection. Traditional demand gen has been about reaching more people. However, when taking an account based approach, being able to reach the right people is one of the core principles. Selecting accounts is a combination of art and science, intuition and logic. Companies combine gut feel, historical performance, and sometimes predictive data science to develop an Ideal Customer Profile, tier their accounts, then allocate their resources properly to work said accounts. Get this wrong, and you’ll be burning money. Get this right, and you’ll be printing money at will. That’s why this is the foundation for every good Account Based Marketing program. In fact, it goes beyond that – it’s the core of Account Based Everything (ABE). Give your customers enterprise identity integration, frictionless SSO across your products and adaptive authentication with MFA and Anomaly Detection. All of this with a flip of a switch. How Should You Select Your Target Accounts? Once you know the specific profile of an ideal account, it’s time to actually pick the accounts; to name the companies you’ll be targeting. On this front, there’s a maturity spectrum, with increasing accuracy and sophistication as you move up. The accuracy and completeness of your account selection improves as you move up the maturity spectrum. Do what you need to do – but be advised: time, money and effort spent on rigorous account selection will be repaid many times over in the number and quality of opportunities you generate. How Should You Tier Your Target Accounts? Not all accounts are the same, so you'll also need to organize your target accounts into tiers, based on how valuable they might be (and how much research and personalization will go into each one.) We take a tiered approach where Tier 1 is a classic ABE/ABM approach, Tier 2 is a lighter approach, and Tier 3 is a hybrid approach. Tier 1 – These accounts get the “full” Account Based Everything treatment – meaning each one gets deep research, a customized plan, personalized content, bespoke campaigns, and lots of one-to-one attention. You map out each buying center, understand where there may be revenue potential, build out the organization chart and see which contacts you know and which you need to know, research key business priorities and individual motivations, and identify relationships and connections to the account. You publish detailed account dossiers, maintain them quarterly, and even have internal chat groups or forums dedicated to each account. Tier 2 – These accounts also get individual research, but perhaps it’s limited to a few key talking points for each account. These accounts may not get completely personalized Plays and custom content, but they should still get highly relevant touches based on their industry and persona. Instead of one-to-one campaigns, these accounts get one-to-few campaigns. Instead of fully bespoke content, perhaps you take content written for their industry and customize it with their logo on the cover and a personalized first and last paragraph. How Many Accounts Should You Have in Each Tier? 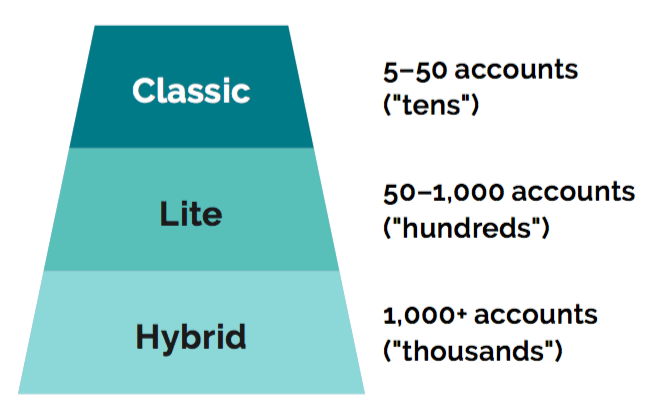 When determining who you’ll target in your Account Based Everything program, an important decision is how many accounts you should be targeting within each tier of your program. How Should You Allocate Your Resources? A given enterprise Account Executive may only be handle a few Tier 1 accounts, but a corporate rep could probably handle a few hundred Tier 3 target accounts at a time. The right number of accounts is the number that your team can handle in a tier-appropriate way. As you can see, there’s a lot that goes into establishing the base for your Account Based Everything program. We’ve just scratched the surface of the first step. To learn more about the WHO (and the WHAT and the WHERE) of Account Based Sales Development, download The Clear & Complete Guide to Account Based Sales Development. How many accounts does your team manage, on average? How did you make this decision? Brandon Redlinger is the Director of Growth at Engagio, the Account Based Everything platform that orchestrates human connections. 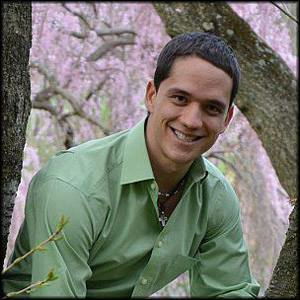 He is passionate about the intersection between tech and psychology, especially as it applies to growing businesses. You can follow him on Twitter @brandon_lee_09 or connect with him on LinkedIn.